AIR ENTREPRENEURING 62 October/November 2018 unmanned systems inside wanted to find who was planting bombs in Iraq and where they came from, when a bomb went off, you could play the imagery backwards and see the bombers, for instance, drive out from a little red house in the south, and two weeks ago they met with other people there. You could get the entire history of what led up to that bomb from watching that persistent imagery." Whereas others working in this field typically use gigapixel sensors, "we use smaller sensors and smaller aircraft, which is less expensive," Walker said. "We can also fly under the weather, at about 2,000 feet. The big sensors need clear skies and higher altitudes—say, 15,000 feet— which works great in Baghdad, but is not so great with cities on the East Coast. We can just fly more aircraft to cover more area." "We can also generate 3-D maps of an area from 2-D images using structure-from-motion techniques," Walker said. "With our algorithms, we can have 3-D models in minutes instead of hours. Think of it as similar to Google Earth in 3-D in near real time." This strategy also can work with sensors other than video cameras. "In oil and gas mar- kets, we can use multi-spectral sensor data to identify and quantify hydrocarbon leaks, gen- erating 3-D models of leaks in real-time." "Our first product will be 12.2 megapixels for a half-square-kilometer map," Walker said. "We are not thinking about building much bigger than 48 megapixels for a 2.5 by 2.5 square kilo- meter area—we can just stitch images together from multiple sensors. The first platform that we expect to carry our product is a fixed-wing UAS from Lockheed Martin, the Stalker—it can fly for hours and watch an entire region." 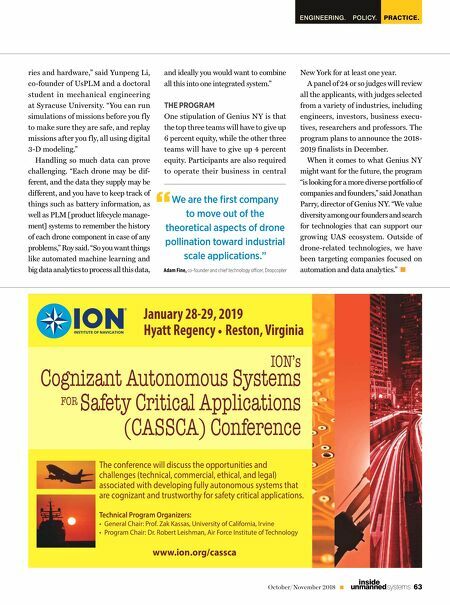 The remaining finalist, UsPLM (Unmanned Systems and Product Lifecycle Management), a spinoff from Syracuse University, is develop- ing software packaged to help manage f leets of drones. "Right now, the FAA [Federal Aviation Administration] does not allow one person to operate a f leet of drones—one operator is needed per drone," said Utpal Roy, co-founder of UsPLM and a professor of mechanical and aerospace engineering at Syracuse University. "In a few years, however, we do think regula- tors will let single operators operate f leets of 20 to 100, maybe 500 drones." "The problem with managing drone f leets is that it can be pretty difficult; if you miss or misinterpret any of the data, you may lose your own drones, or cause property damage, or worse," Roy said. "So what we are planning is to unify all the functionalities of drones to have them f ly under one umbrella." 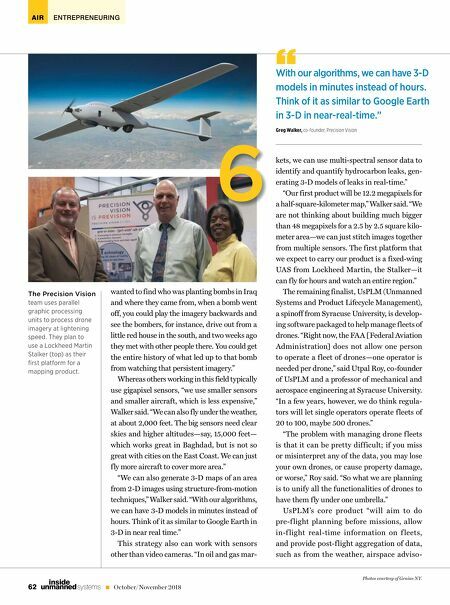 UsPLM's core product "w ill aim to do pre-f light planning before missions, allow in-f light real-time information on f leets, and provide post-f light aggregation of data, such as from the weather, airspace adviso- The Precision Vision team uses parallel graphic processing units to process drone imagery at lightening speed. They plan to use a Lockheed Martin Stalker (top) as their fi rst platform for a mapping product. 6 Photos courtesy of Genius NY. With our algorithms, we can have 3-D models in minutes instead of hours. Think of it as similar to Google Earth in 3-D in near-real-time." Greg Walker, co-founder, Precision Vision "